I know that sounds like a slight exaggeration, but its really not. I’ve struck gold. 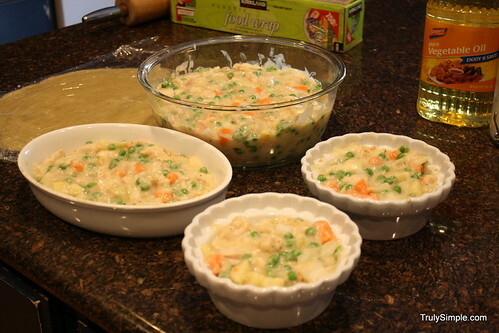 A deliciously creamy pot pie of gold. 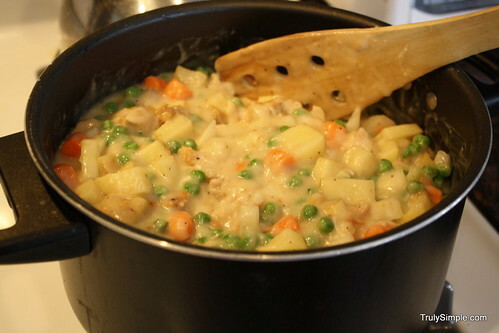 My wife requested pot pie so I was going to reach for the cream of chicken soup and some Bisquick and make it happen, but then she chastised me that she wanted REAL pot pie… my moms pot pie recipe. So I texted my mom and she emailed me her recipe. How 21st century of us. And how good do those look?! Plus its very easy to make. 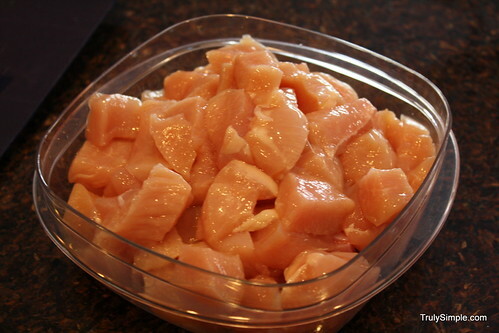 First, cut up your chicken into good chunks. 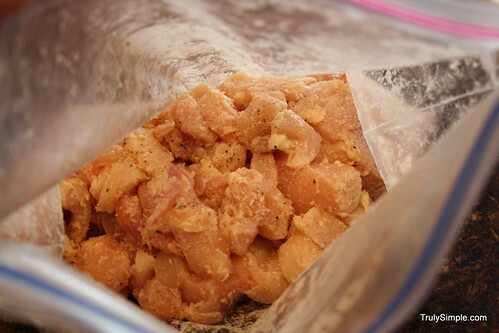 Throw them in a zip lock bag and add a pinch of salt and pepper and shake it up. 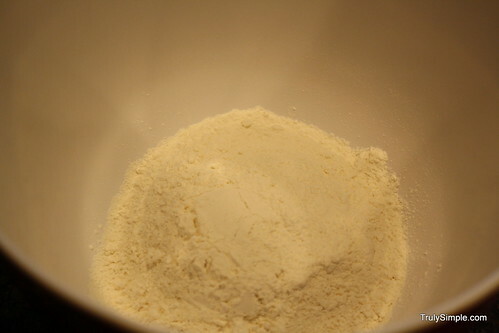 Then add a few handfuls of flour and shake it up again. This will create an awesome coating that is the consistency of glue. Very sticky and messy, but that is all part of the magic here. 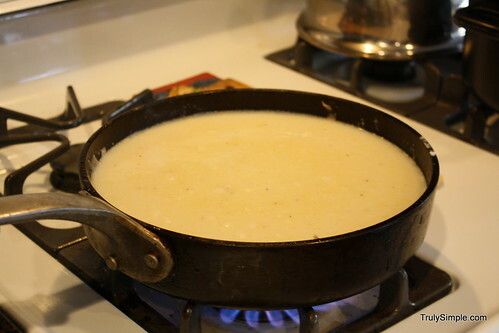 Fire up a hot skillet on the stove and add some butter or oil. Cooking on a medium high flame add the chicken. 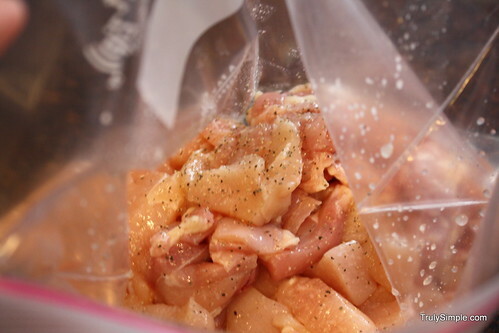 You only want to brown the chicken, so only cook it for a few minutes, turning over when brown. 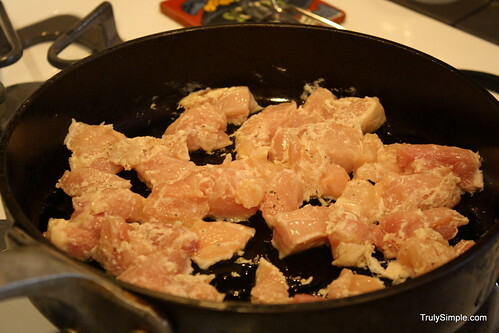 Now the flour coating may make the chicken stick to the pan while frying, but thats OK. Actually its better than OK. That’s where the magic begins. 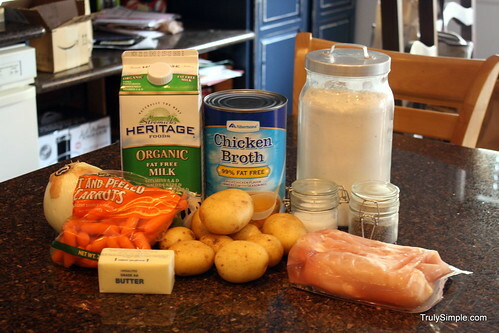 Take the browned chicken out and place it in a larger pot. 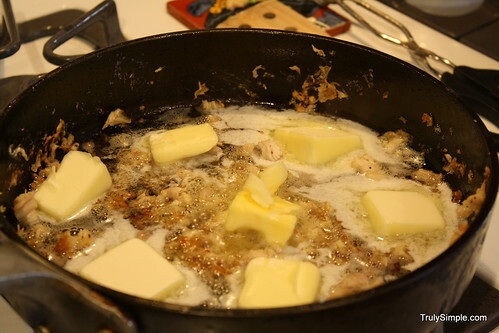 With all those good fried chicken bits stuck to the pan add your butter and let it melt. 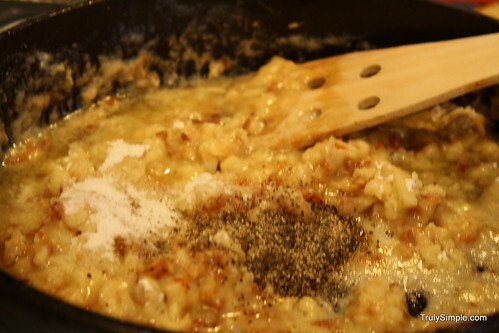 Add the salt and pepper and stir that awesome goodness up. It will be nice and thick and awesome. 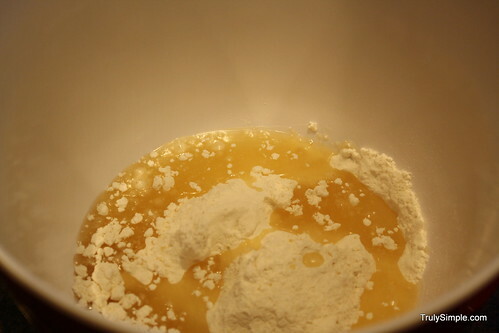 Stir in chicken broth and milk. Heat to boiling, stirring constantly. Boil and stir for one minute. 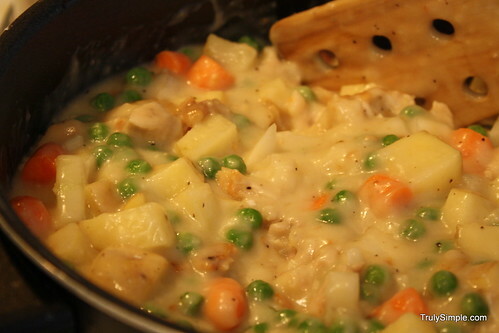 Pour that awesome creamy mixture over the browned chicken and stir in the vegetables. oh wow this looks good already. Now time to make the crust. 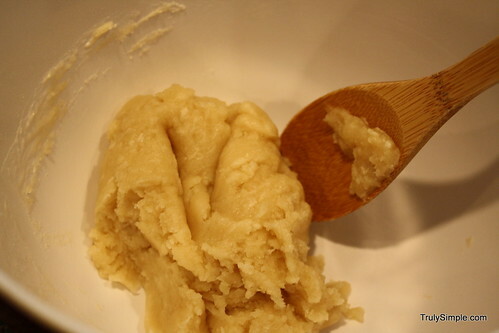 I forget how easy it is to make dough from scratch. For some reason I have it stuck in my head that his is some crazy-super-hard-time-consuming endeavor, but it never is. 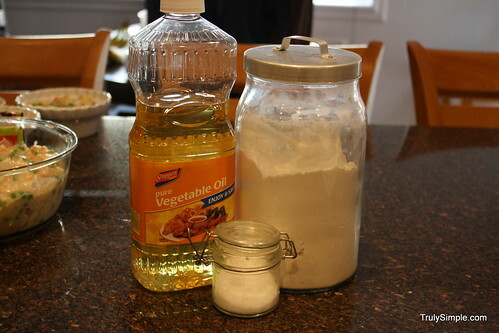 Then add oil and water. Then you mix it up. That’s it. Seriously. 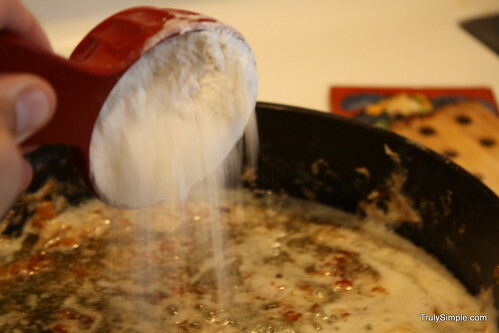 No need to sprinkle surface with more flour. 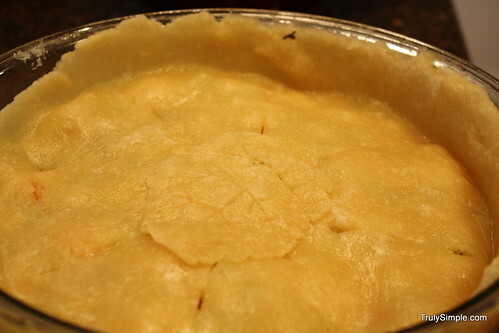 This just makes your pie crust tough. 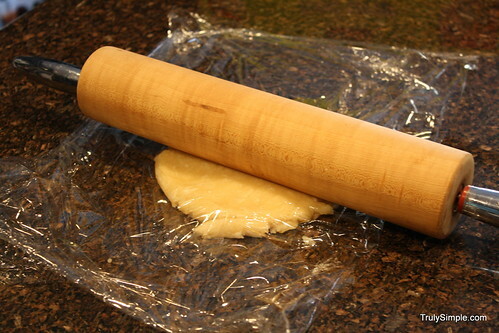 Simply wrap the dough in between two layers of saran wrap and roll it out. 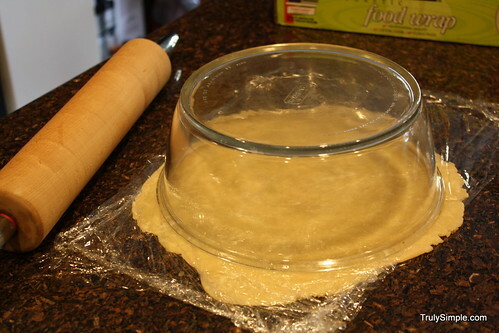 Lay the dish over the top to get the right size when rolling out the dough. 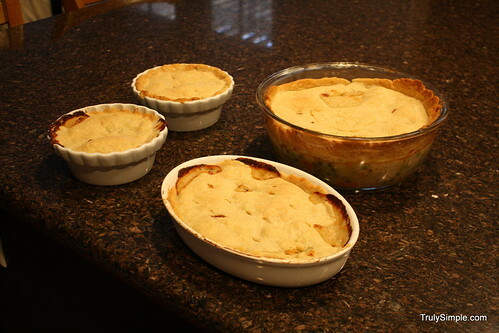 I made a bit more pot pie than I anticipated, but that’s never a bad thing. I was also cooking for a big family dinner with some of my great friends so more is always better. 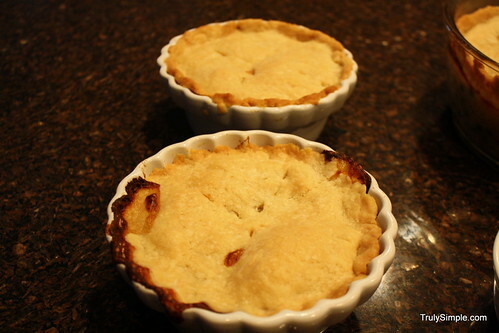 I had to make two batches of the dough for all of these little pies. 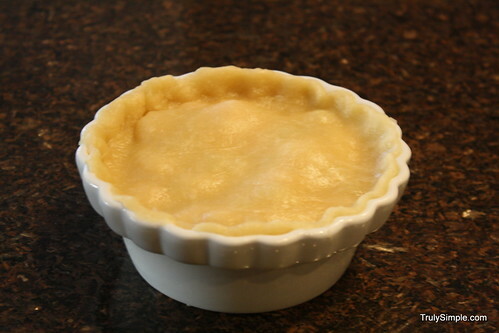 Lay over baking dish (no bottom crust for this pie) and then cut slits (as artistically as you please) so steam can escape as you bake. Notice my super artistic attempt at a little leaf on top. Key word attempt. Just stuff the crust around the edges. Cook uncovered in 425 degree oven until crust is brown – 45 – 60 minutes. 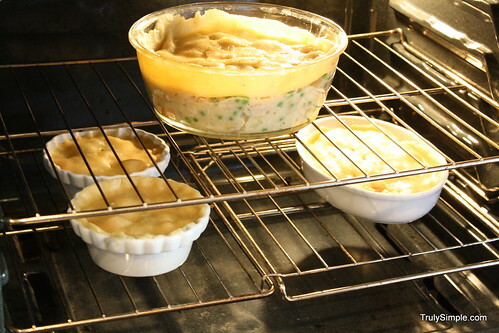 It bubbles up and over so I usually put a cookie sheet underneath to keep the oven from getting all messy. And voila. 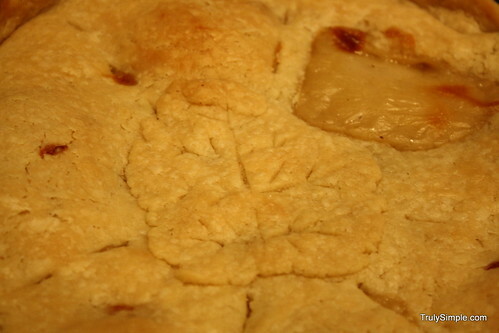 The house smells amazing and the pot pies are gorgeous. But lets talk seriously for a minute here. This was THE BEST pot pie I’ve ever had in my entire life. The crispy browned chicken bits de-glazed off the pan to mix with the creaming goodness and the veggies and then the crust; It was just all so amazing. 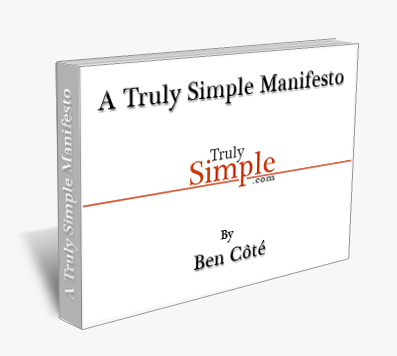 I cannot recommend this highly enough. If you only make one recipe ever from this site, this should probably be it. plan a family dinner night and make this. Your greatness will be praised from the mountains and you shall be hailed as a hero. No exaggeration here, it is really that good. P.S. When (not if) you make this, let me know the wonderful things your friends and family say about you. Its nice to be loved. and thanks Mom! Your the best.